Last year our diocese celebrated the 50th anniversary of its installation. 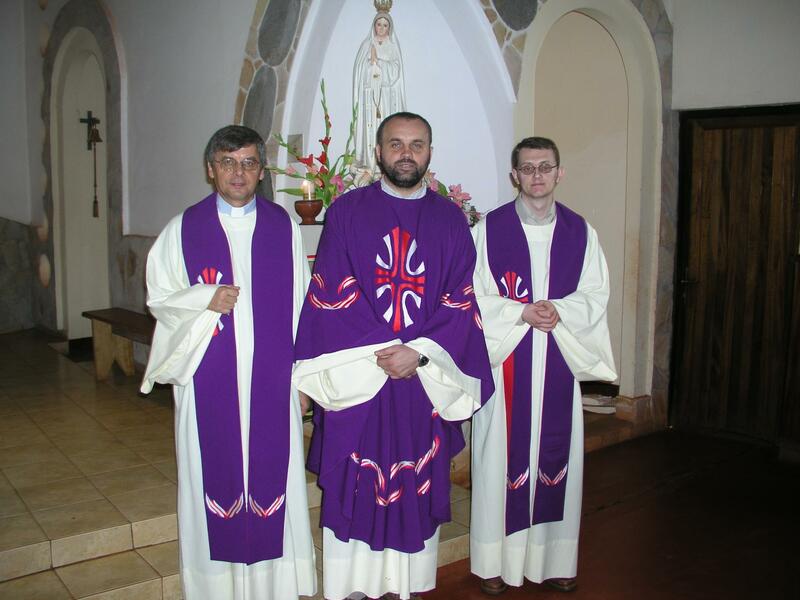 In this occasion the Bishop organized a special program of evangelization. He gave our Apostolate of Divine Mercy an important mission to prepare this celebration by conducting retreats and religious education classes in each parish of the diocese. We visited 20 parishes and entrusted many peoples to The Divine Mercy. This consecration was very important as their response to God’s love. This consecration brought hope, peace, and freed from fear many peoples, since they felt loved and protected by the Lord, and they became reconciled with Him. Last year (2005) The Divine Mercy Feast was marked by death of Pope John Paul II. In our shrine we recited vigil prayers. After 9 o’clock, bishop proclaimed the sad news: “The Pope passed away. He went to our Heavenly Father.” The people’s reaction to the news was very expressive: Women wept and lamented. The men were played on the drum a special beat. In the African culture, the art of playing the drum has a very important significance. This is a way of communicating to God that a deceased is on his/her way to Him. This is also a prayer, because by the drumbeat an African implores God to receive this person in His House. The other meaning of this drumbeat is to inform everybody of what has happened in the village. At that moment we all started to pray to the rhythm of drum for the soul of John Paul II who imparted his blessing for our image of the Merciful Christ and our Apostolate, as well as establishing of our shrine of The Divine Mercy. Continuing our work for The Divine Mercy in our mission, we built 2 chapels. One was dedicated to Saint Faustina Kowalska, another – to Holly Cross. 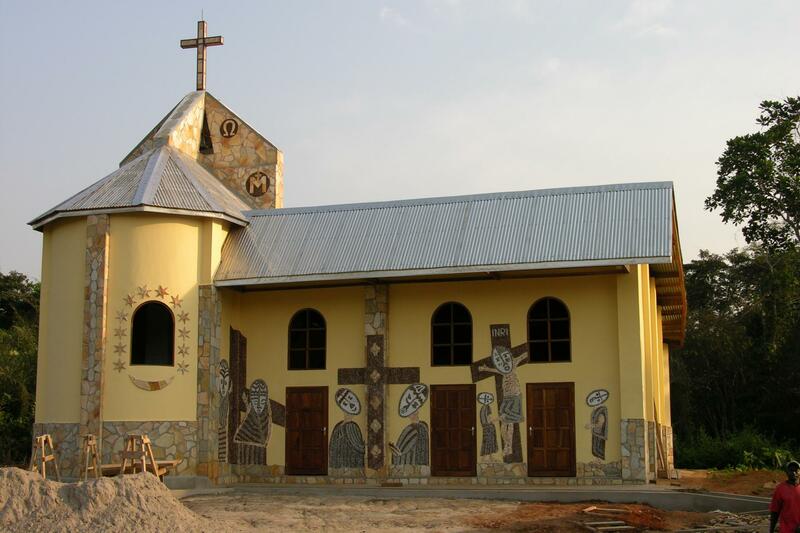 This second chapel was consecrated by Apostolic Nuncio to Cameroon, Bishop Eliseo Antonio Ariotti. This is the first chapel built on the border of tropical forest in the eastern part of the country. This region is very poor and needs evangelization and Church presence, particularly, The Divine Mercy presence in order to free peoples from the evil, fear, and to bring about the social betterment. I brought with me images of the Merciful Christ made in the traditions of the African art. By using those pictures we try to introduce to our faithful the Gospel and the Person of Christ. The Christ’s face is presented as a traditional African mask. In the African culture a mask has an important meaning. It represents another person whom we wish to become. It is the way of showing the African beliefs. Every man wants to be transformed, to become strong, a hero; to be free from evil… Who has the power to transform us? Who can convince us that we are God’s children? Christ transforms us by his love and makes us believe. He has become Incarnated and entered into our history in order to make us holy. He forgives us our sins and restores our human dignity, He frees us from sin and leads us to happiness. The rays of Blood and Water gushing from His side are gifts of God’s grace for us; they make us holy and strengthen our love for God. The person of Christ is surrounded by different traditional African symbols. At each side of Jesus, we see a symbolic presentation of a man with outstretched arms that depicts his desire to get closer to God and receive all His blessings. On top we see the sun shown as a spiral line that aims at the center of the picture – Jesus. At the bottom there is an image of a bird flying upwards. On both sides of the image we see intertwined lines representing life and death. This image has been made by unfortunate young women (fallen and handicapped) in care of Sisters of the Divine Providence. We have been made very happy by receiving God’s blessing and help from our benefactors. Thanks to them, to theirs gifts and prayers, we were able to create our Apostolate, the Shrine, and complete others projects. 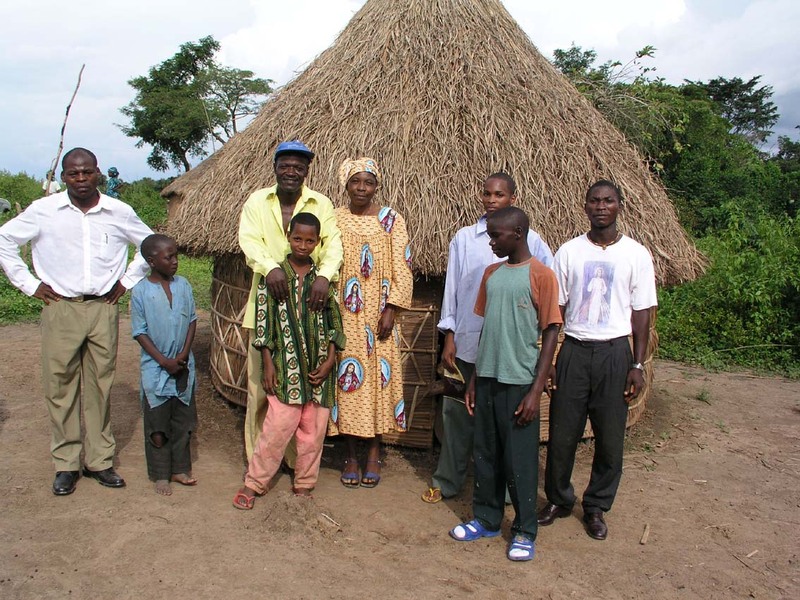 Also, we were able to assist many peoples who are poor, handicapped, and sick. We pray for our benefactors and friends and offer Holy Masses and the Divine Mercy Chaplets for their intentions. We trust that our benefactors and friends will share in the Merciful Christ’s promises because we pray together and we practice works of God Mercy. We ask everyone to please continue to work with us and to be the Apostle of Divine Mercy. We continue our visits, along with our five trained leaders, in all parishes and communities, bringing them our program of evangelization. We proclaim The Divine Mercy message and share with them our spiritual experiences. If you feel in your heart the desire to do works of mercy, we invite you to support this mission through your prayers and gifts.